When Lord Chaitanya was travelling through south India – it was actually this time of the year catur masya, the rainy season – he stopped in Sri Rangam. And there he decided to remain for the four months of the rainy season. So there is a beautiful story about Sri Rangam. Lord Chaitanya Mahaprabhu understood that this place was actually the capital of Vaisnavaism for the whole of South India. Sripada Ramanujacarya and Yamunacarya made this their base, and propagated the highest principle of bhakti form that place. Ramanujacarya especially taught two things that Lord Chaitanya extracted and taught within His own mission. And that is, pure bhakti, uncontaminated by jnana or karma, and the importance of serving devotees. Ramanuja Acarya very strongly established these principles. So when Lord Chaitanya went to this place, the largest temple in all of the world, he began to have his kirtana, chanting and dancing, before the deity of Sri Ranganatha. And he met one Brahmin, his name was Venkata Bhatta. This Brahmin was actually one of the head priests of the temple. And to this day his descendants are still the head priests of the temple. He invited Lord Chaitanya to his home; when Lord Chaitanya came, Venkata Bhatta offered Him his family, offered Him his house, and offered Him his very life. Lord Chaitanya (was) at that time a great sannyasi, and Venkata Bhatta washed the lotus feet of the Lord; then he drank that water; and then he shared it with his family. There were three brothers: Trimala Bhatta, Venkata Bhatta, and third brother was Prabodhnand, who later became Prabodhananda Sarasvati. So they all drank the water that washed the lotus feet of the Lord, and then they gave to Venkata Bhatta’s son who was just a small boy; his name was Gopala or Gopala Bhatta. And when he saw his parents and his uncles so much worshipping the Lord, and when he drank the water of the carnamrita, immediately upon drinking that carnamrita, his heart just overflowed with ecstatic love of Krsna. This little boys’ eyes were flowing with tears of ecstasy and his whole body was trembling and shivering in ecstatic love, and from that moment he could not give up the association of Lord Gauranga even for a moment. When one has love, the nature of that love is desire to serve; love is not stagnant. Srila Prabhupada explains: “You never see pictures of gopis sitting in lotus posture with their eyes closed. The Gopis are all either churning butter or milking cows, or dancing or singing or playing instruments.” They are always doing some service. This is love, and love is to serve. Love is to make sacrifice of yourself for the object of your love. So Gopala Bhatta became so happy to serve the Lord, and for his father Venkata Bhatta, it was the joy of his life to see his son serving this great sannyasi Lord Chaitanya, enthusiastically. Venkata Bhatta understood that Lord Chaitanya was the Supreme Personality of Godhead; that was revealed to him gradually. He told his son Gopala, “This is the most important part of your life – you serve Lord Gauranga.” So he (Gopal) would serve him throughout the day and night. And his love was so pure. The purity of love is when we are not concerned with our own happiness; we are concerned with the happiness of the object of our love, this is devotion. One night Gopala Bhatta had a dream, a wonderful dream, where he was actually in Navadvip. Lord Chaitanya was strolling down the streets along with Gopala Bhatta and amongst his other associates. Nitayanand Prabhu and Advaita Prabhu, they very lovingly embraced little Gopala, and they began to tell him something very confidentially. As they were about to speak, he(Gopal) woke up and in great haste the boy ran to where Lord Chaitanya was present, and fell at Lord Chaitanya Mahaprabhu’s feet. Lord Chaitanya was sitting there with his shaved head, with his saffron robes. But in order to fulfill the desire of his devotee – right before Gopala Bhatta’s own eyes – the Lord transformed into a cowherd boy, with a beautiful, beautiful bluish complexion, like that of a newly formed monsoon cloud. When Gopala Bhatta saw this beautiful form, his heart began to tremble in ecstasy. Then right before his very eyes, this beautiful, bluish form of Gopinath gradually turned into a golden form, the form of Navadvip Chandra, with beautiful, beautiful black hair, curling over his shoulders. He had beautiful lotus eyes, his eyebrows were raised, his glance was such a glance that would completely charm and conquer the hearts of all living beings. He had a wonderful smile on his face. When Gopala saw this, with tears in his eyes he fell at the feet of Gauranga. Then he looked up and Lord Chaitanya was again in the form of a sannyasi. In this way every moment that was approaching was becoming more and more painful to them, because the Lord was going to leave. And before the Lord left, he reconfirmed to Gopala Bhatta that all of his desires would be fulfilled. Gopala Bhatta as the obedient child of his parents. Lord Chaitanya travelled throughout South India, Western India, and then he returned to Navadvip. Meanwhile, Gopala Bhatta’s mind was completely fixed in the mercy of Lord Chaitanya throughout the day and night. He was constantly chanting the holy names of the Lord and constantly remembering the mercy of the Lord. He became a student of his uncle Prabhodananda Sarasvati and became the most celebrated learned scholar of the Vedic scripture in all of the southern part of India. And he became very famous. One time a Brahmin came to the house of Venkata Bhatta, and he began to praise him, “You are so fortunate, you have a son like this, he has such pure devotion to Lord Krsna. He is so submissive and obedient to his parents. I have never seen anyone like this.” Venkata Bhatta upon hearing his son being glorified, he explained to the Brahmin about the great virtues of his own son. Actually this is a great lesson; a parent should be satisfied when they see their son or daughter surrendering to Krishna. That is the sign of a real loving parent. Venkata Bhatta was a real father and his mother was also someone who had completely surrendered to the Lord. And their pride and joy was that their son was such a devotee: always thinking of Krishna, preaching Krishna katha, dancing in ecstasy and chanting the holy name. 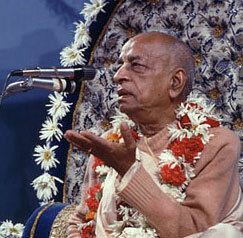 (everyone chants hare Krishna) And if you become a parent like that, then your children will never want to leave you. Gopala Bhatta stayed home. Lord Chaitanya had said, “They are such nice devotees, you should serve them.” And so he(Gopal) remained at home with them until they were old. Just before leaving their bodies, they told Gopala Bhatta, “We give you blessing and permission. You go to Vrndavana and become a Gosvami.” This was their heart’s desire. How many parents say like this to their children?! So in this way they gave order to their son, “Go to Vrndavana. Become Gosvami.” And then with the thought of Lord Chaitanya Mahaprahbu’s beautiful form in their hearts and his name upon their lips, Venkata Bhatta and his wife left this world and went back home back to Godhead. Gopala Bhatta went to Vrndavana. Gopala Bhatta he went to Vrndavana. He was about thirty years old when he went to Vrndavana. And while he was there, he met with Rupa and Sanatana Gosvami. Meanwhile Lord Chaitanya was living in Jagannath Puri. 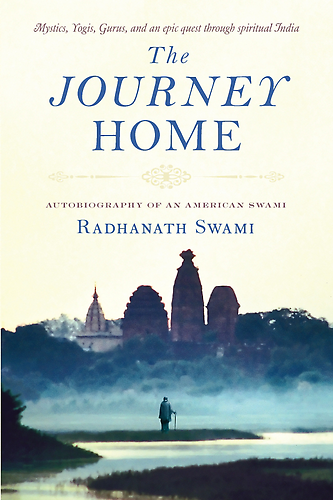 Everyday he would go from the house of Kasi Misra – Gambira where He resided – to the Tota Gopinath temple, where Gadhadhara Pandit would reside. One day Lord Chaitanya went to the temple of Gadhadhara Pandit. And after worshipping Gopinath, having nice kirtana, he sat down with his associates. He explained, “I have not heard anything from Rupa and Sanatana from Vrndavana for a long time. I have not gotten any message.” When he said that, a messenger came and said, “I have brought a letter from Rupa and Sanatana in Vrndavana.” Lord Chaitanya, with great happiness opens the letter and there, just as he wanted to hear, was written. Rupa and Sanatana said, “Gopala Bhatta, this great Brahmin of South India has come to Vrndavana. He is a wonderful Vaisnava and we have accepted him as our own bother.” When Lord Chaitanya heard this, he was very happy. What is the most blissful experience for the Lord and for the spiritual master? To see the devotees exchange love with one another, and really becoming brothers and sisters in the sense of selfless loving service. Srila Prabhupada said, “You can show your love for me by how much you cooperate with one another.” Srila Prabhupada‘s idea of cooperation is not that you tolerate one another – minimum at least we should do that much – but real cooperation on the path of bhakti means something very positive: showing great affection, love and willing to make great sacrifices for the welfare of each other; that is cooperation. For the purpose of making the Lord’s mission attractive to the whole world. Gopala Bhatta went to Gandhaki river, high in the Himalayas, and there he took his bath. With water, Saligram Sila appeared in his pot. He poured it out, and went to take it again, and Saligram Sila were again in his pot. Whenever he put his bucket in the river, in the water, twelve Saligram Silas would appear in his pot; and he understood – “These are the forms of the Lord I am supposed to worship.” He went back to Vrndavana and worshiped these Saligram Silas with great devotion. One time a very wealthy devotee came to Vrndavana and offered jewels, crowns and clothing to the various Gosvamis who had deities. He also gave to Gopala Bhatta Gosvami; Gopala Bhatta Gosvami told this devotee, “I am only worshipping Saligram Sila; I cannot put all these ornaments, crowns on Saligram Sila.” He said, “No. You keep them.” So, actually it was the day Nrsimha Caturdasi, the appearance day of Lord Nrsimha deva. He began to chant wonderful prayers of Prahlada Maharaj to Nrsimha deva, and then took rest that night. He rose in the morning and went to Yamuna to take his bath. When he came back, one of his Silas, which was called the Damodar Saligram Sila, grew into the beautiful form of Krishna, who had charming smile on his face, in his three-fold bending form, and playing upon the flute. Gopala Bhatta called Rupa, Santana and the other devotees – Loknath Gosvami, Bhugarbha Gosvami, Kasisvar and Raghunath dasa. When they saw this beautiful form of the self-manifested deity, simply out of love for the devotees, they named him as Radha Ramana: Krishna who gives pleasure to Srimati Radharani. We were explaining how Krishna fulfills the desires of such pure surrendered devotees. Three principle deities of Vrndavana – Madana Mohan, Govindaji and Gopinath – these three deities were the life and soul of all Gaudya Vaisnava, and especially the life and soul of Gopala Bhatta Gosvami. This particular deity of Radha Raman – it is explained in our bhakti shastras – had manifested in a form in such a way that from his feet to his waist he was identical to the deity of Madan Mohan; his hands and chest had identical beauty of Gopinath; and his face was identical to that of Radha Govindji. In this way, the three life and soul deities of Gaudya Vaisnavas are manifested in one form of Sri Radha Raman. And he was only about twelve inches tall. Gopala Bhatta, his mind was always fixed in serving the devotees and the beautiful form Sri Radha Raman. He would collect, with his own hands, flowers, make beautiful garlands, and decorate the Lord. In fact, his meditation day and night was simply to serve his beloved. But as he looked at Radha Raman and serve, he would think of the mercy of Lord Gauranga Mahaprabhu. He remembered how when he was a small child Lord Chaitanya bestowed so much kindness and love upon him. By thinking of the beautiful form of Lord Chaitanya, tears would flow from his eyes in great ecstasy. He remembered his father’s instructions to him. “You should always worship the lotus feet of Lord Gauranga.” Knowing the heart of Sri Gopala Bhatta Gosvami, Radha Raman wanted to fulfill even that desire. And right before his eyes Radha Raman transformed into the beautiful form of Sri Chaitanya Mahaprabhu, with His arms raised, loudly chanting the holy names. It was confirmed, in the most wonderful way, that serving Radha Raman was directly serving Lord Gauranga Mahaprabhu, as they are one and the same personality. When Rupa Gosvami and Sanatana Gosvami left this world, Gopala Bhatta Gosvami was so much immersed in the ocean of ecstatic love in the mood of separation from those devotees. Ramananad Raya prayed, “The only pain there is, is to be separate from the association of devotees; the only real tears worth that are shedding in this world, are tears of feelings of separation from the Lord and His devotees, because those tears water the creeper of devotion within our heart.” We should not cry over material matters; we should not cry because of frustration within this world. All you get out of that is, you just waste so much water from your body. There is no benefit. The tears of separation, from the Lord and His devotees, each tear is more precious than the rarest most valuable diamond. So Gopala Bhatta was practically constantly just immersed in weeping and crying in separation from these two great souls, who were so dear to his heart. When that day will be when we can develop such attachment, and such love for the Lord’s devotees! That should be the aspiration of our life. It was by Goplala Bhatta’s instructions that Srinivasa was entrusted to study the Vaisnava literatures under Jiva Gosvami, which is very significant. To see the loving trust amongst the Vaisnavas! He told Srinivasa, “You go. Study under Jiva Gosvami. This is my desire.” And by his benediction, by the benediction of Gopala Bhatta Gosvami, it was Srinivasa Acarya who first took the first literatures of our Gaudya Vaisnava Sampradaya, and began to distribute them throughout the world. When Krsnadasa Kaviraj Gosvami,was asked by the Vaisnavas to write the history of the life and teachings of Lord Chaitanya, he understood that the history of the life of Lord Chaitanya means to explain his loving relationship with his devotees. So he approached each and every senior devotee in Vrndavana for blessings, because a humble devotee never embarks on any important activity without receiving the blessings of the Vaisnavas. When he approached Srila Gopala Bhatta Gosvami, Gopala Bhatta Gosvami gave him his blessings with one condition. “You do not speak about me in your book. You do not even mention my name. If you follow that instruction, you have all my blessings.” So, somehow or other out of etiquette, Srila Krsnadasa Kaviraj Gosvami wrote the entire Chaitanya Caritamrita – in one or two places he very nicely slips in the name of Gopala Bhatta – but other than that he does not describe any of his glories, out of respect for the desire of this devotee. The pure devotees of the Lord, they never want to be glorified; they simply want to see the Supreme Personality of Godhead and other Vaisnavas being glorified. 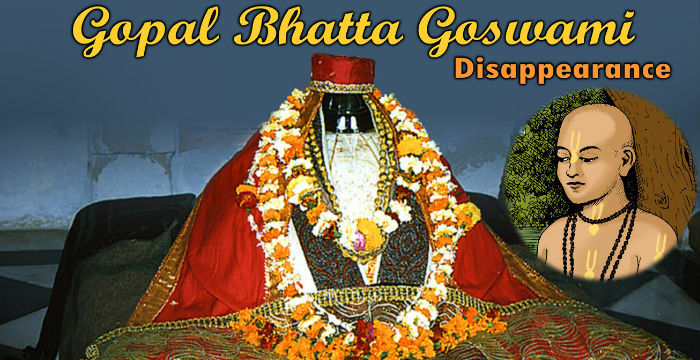 Gopala Bhatta Gosvami dedicated his life to glorifying Vaisnavas and giving shelter to the fallen souls. By Lord Chaitanya’s own arrangement, he revealed the glories of Gopala Bhatta Gosvami through other means, by which we could all achieve the great benefit of hearing these wonderful narrations. So it is through appreciating and understanding the bhakti of the vaisnavas that we actually have real access to the service of the Supreme Personality of Godhead. Lord Chaitanya Himself said that the real conclusions of the scriptures can never be understood by any scholarly attempts of reading those scripture. The conclusions of these sastra are hidden, and they are revealed only through the hearts of pure devotees, who have surrendered everything in the loving service of Lord. When we receive their mercy, then we can understand the real essence of all knowledge – surrender to Krishna – which is quite obvious.